That's it from Holyrood Live today, Tuesday 11 September 2018. Brexit Secretary Mike Russell warned that leaving the EU without a deal would "result in chaos" despite work which has been done to prepare. Mr Russell told MSPs that work was being done to be ready for the "worst case scenario" of a no-deal exit. He said the least damaging approach would be for the UK to remain in the single market and customs union. The Scottish Conservatives said this "empty posturing" had been contradicted by "good news" from the negotiations. Rural Affairs and Natural Environment Minister Mairi Gougeon replies to Claire Baker that she would be "really keen" to accept her offer to visit KInghorn Ecology Centre. Ms Gougeon says the ecology centre is a real community hub and looks fantastic and is an inclusive community led charity. She explains that in January 2014 the Scottish Land Fund helped the ecology centre purchase more land for development. The minister adds that it is fantastic that MSPs can celebrate the 20th anniversary of the centre as it is a real success story. She highlights work the centre is doing with three schools to develop outdoor learning. As the debate draws to a close the minister praises the work of the volunteers and the ecology centre and its workers in the gallery. Tory MSP Alexander Stewart details the history of the ecology centre and how it came into being. "Individuals and organisations have benefited so much from it," he says. Mr Stewart praises the "lifeblood" volunteers of the organisation. He concludes by congratulating the centre for its various achievements. Labour MSP Claire Baker welcomes workers and volunteers from the Kinghorn Ecology Centre to the gallery. Ms Baker says the ecology centre's new facilities are "fabulous" and can be used for classes and even wedding receptions. She praises the work of the volunteers and she praises the Tool Shed initiative which is part of the Men's Sheds association. The Labour MSP cites the work with those with dementia and the repair of Singer sewing machines which are often sent to Africa. Ms Baker concludes saying the centre is an excellent example of a community-run group with environmental objectives. The organisation came into being through an advisory group set up by people from the local community and residents of Craigencalt Farm. The purpose of the organisation, known then as Craigencalt Ecology Centre, was to develop and manage the Kinghorn Loch site for community use. In 2006 a decision was made to change the name of the organisation and today it is known as The Ecology Centre. 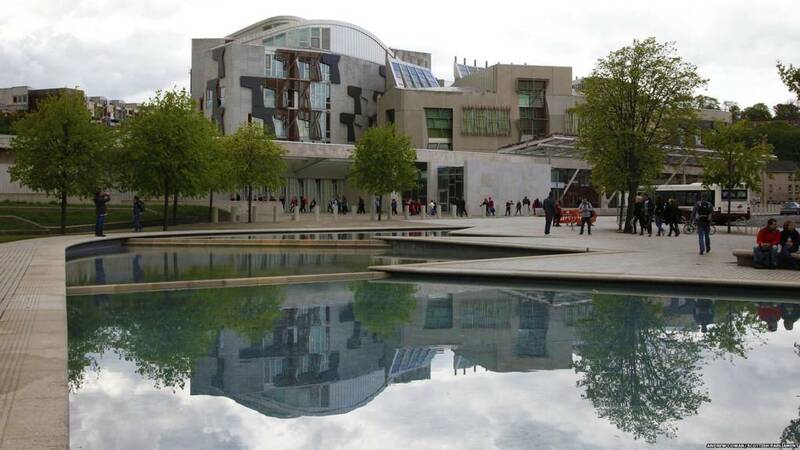 MSPs will now debate the 20th anniversary of the Ecology Centre in Fife. It is being led by Labour MSP Claire Baker. The Conservative amendment is backed unanimously. The Labour amendment is also passed by 88 votes for and 29 against. The Scottish government motion as amended is passed by 88 votes for and 29 against. Communities Secretary Aileen Campbell welcomes the constructive contributions to the debate, saying members focused on how to boost social enterprise going forward. She urges any struggling social enterprises to contact Just Enterprise for support. Social enterprises are nimble and agile, and can respond to community need, the minister argues. We need to see much greater recognition of what social enterprises can do for community planning partnerships, Ms Campbell says. Tory MSP Michelle Ballantyne welcomes the Social Enterprise World Forum back to Scotland and congratulates all taking part. Ms Ballantyne says there has been a huge growth in the number of social enterprises over the last 30 years. She welcomes the Scottish government support for the sector but regrets some MSPs having politicised the issue. The Tory MSP insists social enterprises are a vital part of democracy and it is good to see Scotland at the forefront of the development. However they are businesses and they require the right skill sets, she tells the chamber and running them is hard with many running at a loss. Labour MSP Alex Rowley says social enterprise plays an important part in daily life. Our economy is not set up to deliver in the interest of the many and that is why the gathering of social enterprises is welcome, he tells the chamber. He states there has been a missed opportunity in growing social enterprise, calling for more to be done to ensure they are properly included in community planning partnerships. At its core, a social enterprise is a more ethical and dynamic way of doing business, Mr Rowley argues. Background: Would you give up your job to start a social enterprise? Video caption: Would you give up your job to start a social enterprise?Would you give up your job to start a social enterprise? Two entrepreneurs on the Zinc programme talk through their ideas for start-ups they hope will make a difference to people's lives. Aziz Lalljee is one of a team working on Gilda, which aims to help connect older people in a social network to reduce isolation and loneliness. Fiona Vallance is part of a group of people developing Amble, which uses data to create safe walking routes for women. Scotland's social enterprise strategy was published in 2016, providing a framework for the following decade. The strategy is being implemented by a series of three-year action plans and progress on the plan is reviewed by a multi-agency Social Enterprise Forum. Josh Littlejohn MBE may not be instantly recognisable, but you’ll know who his mates are. George Clooney; Leonardo di Caprio; Prince Harry and Meghan Markle — they’ve all dropped by to lend their support to his Edinburgh-based business. Josh is the co-founder of Social Bite, a social enterprise with small chain of cafés, created with the aim of ending homelessness in Scotland.